My summer bucket list was a little different than those of my friends. We all had food-dominated lists, but while theirs were comprised solely of restaurants to try, mine had recipes to make and ingredients to use up. As usual, there was an overabundance of frozen bananas in the freezer, so it seemed a good time as any Bon Appetit‘s best banana bread. I used a 9×5″ loaf tin (how you ever noticed how British, and probably other people, use “tin” instead of “pan”? Even now, I can imagine Ben from SORTED Food saying it in his accent) instead of a 8 1/2 x 4 1/2 pan. Close enough. I cut the sugar from 1 cup to 3/4 cup. Don’t try the mascarpone on its own, no matter how rich and tempting it looks. Unless you love the taste of butter (looking at you, Paula), I don’t suggest it. You’re going to want it at room temperature so that it creams together more smoothly with the butter and sugar. I added a dash of vanilla here as well, since vanilla rounds everything out nicely much like how cream does for a sauce. In a fit of deja vu (like when I started making raspberry custard cups, then discovered the absence of milk in the fridge), I realized I only had one egg. This was, of course, after I already mixed the butter, mascarpone and sugar. Thank goodness for how convenient Trader Joe’s is. Since the bananas were frozen, I pulled those out first before doing anything else. It’s actually painful trying to peel them. They were so cold they made my hands hurt, in addition to the fact that they weren’t easy to peel when frozen, so I had to hold on to them for a long time. Sigh. They were so cold that even after creaming the butter/sugar and coming back from Trader Joe’s, at least 40 minutes later, the bowl they were in had ice crystals on the outside. I waited until the last possible moment to add them, when they were only chilled banana mush, instead of banana slushie. 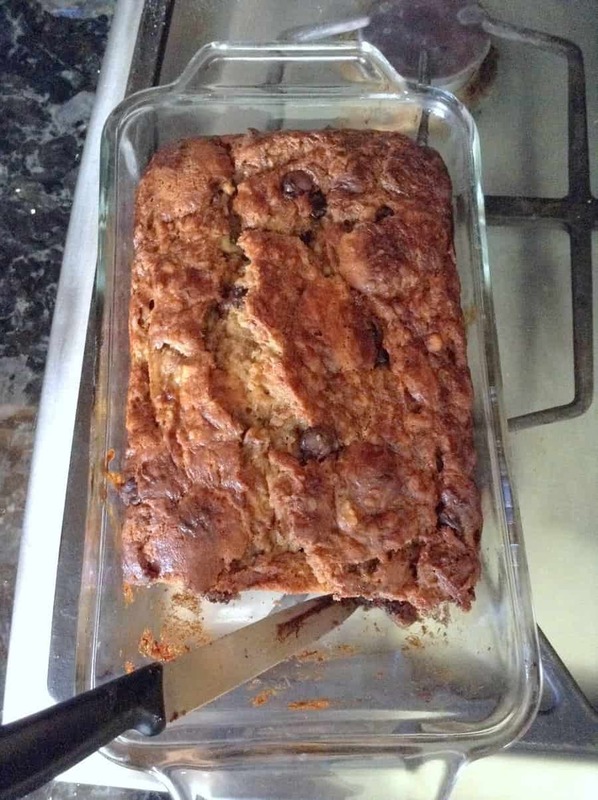 It looked to be about half batter, half banana, which seemed high, but it is banana bread for a reason. I utilized the optional chocolate and nuts, for more texture and flavor. I used some semisweet chocolate chips I had lying around from yesterday’s oatmeal buttermilk pancake adventure. I toasted the nuts, as usual. The bread took 78 minutes and 8 toothpicks. It kept coming out wet, but I gave up and just hoped that the bread would carry over cook. You shouldn’t wait an hour for the bread to cool, like the recipe tells you to. No, fresh banana bread is a gift from the quick bread gods, one not to be squandered. Just cut the loaf and try not to moan too loudly when the first crumb hits your tongue. Would I make this again? Maybe. Mascarpone isn’t something I normally have, and I’m wary of buying things that don’t get used up in one recipe and get abandoned in the fridge. That being said, however, wow and hot dang and who cares if you’re left with a random 2/3 cup of mascarpone. The crumb was super moist but not gummy like I feared. The burnished crust and nuts were crisp, and contrasted wonderfully with the softness of the bread. There was great banana flavor, which was helped only marginally by the addition of chocolate. The “best” description might actually fit this banana bread, instead of being like this. Lightly grease a 9×5 loaf pan and line with parchment, leaving overhang on long sides. Whisk dry ingredients in a medium bowl. Beat sugar, mascarpone and butter in a large bowl until light and fluffy. Add vanilla and eggs one at a time, beating to blend after each addition and scraping bowl as needed. Reduce speed to low, add flour mixture, and mix until just combined. Add bananas and mix just until combined. Fold in chocolate and nuts. Scrape into pan; smooth top. Bake at 350F until a tester comes out clean, 65-80 minutes. Try to let it cool before you devour.